This episode of SEM Synergy starts with news of the Google update Penguin 3.0 and ends with an interview with Ric Dragon, @RicDragon, CEO of DragonSearch Marketing. Virginia Nussey: While we were on Thanksgiving break, things didn’t stop in the search world. I guess there was some talk about a Thanksgiving shuffle in [Google] rankings. Bruce Clay: I read a number of people indicating that they had gotten hit when 3.0 Penguin came out, and that they were starting to recover, and then all of a sudden they took another hit. So, maybe a kinder, gentler Penguin isn’t what we see. Rob Ramirez: We also saw reports of people who got hit from Penguin 3.0 and then recovered when this refresh, I guess we’ll call it, happened over the Thanksgiving holiday. It’s not totally unheard of for Google to refresh their algorithms, especially their larger ones, about a month after it initially launches. Usually they’re able, at that point, to see the errors, the types of things people are complaining about. The types of results that they didn’t anticipate in a live environment. About a month in they’re usually able to flip the switch again and kind of massage things to get them to where they want to be. Bruce: You know I think we’re seeing two different phenomenon. The duration of the Penguin 3 rollout is months. I believe that the real intent behind that is it takes a long time to respider the entire 60 trillion database element. We covered this a little in another show. It takes a while for them to fill in the elements of a database that were never really in the database. They create the fields but now they have to populate them by respidering everybody. And then they have to actually determine trust by looking at who links to the people who link to you. It takes a long time. It’s very similar to the PageRank type things. And when they do that, it just becomes horribly lengthy in time. I thought that what was happening was that there was a consistent evolution in ranking as more and more pages were being reindexed, as the elements of the database were being filled in, it seemed to me at least that that’s what was going on. I’m not with Google so who knows what they’re doing. Quite frankly it seemed that way. What we saw, still I agree, seemed to be more of an algorithmic change; in other words, the ones that were already in the database, they were impacted because that is about changing the formula that handles the data in the database, which is different than populating the database which takes a lengthy amount of time. I was mentioning earlier, way back when, I think it was 300 Internet years ago, there was an update referred to as Chicago. The story and preamble to Chicago is, we had developed a product that would just document links. It was called LinkMaps and it would go out and find everybody linking to you, very much like what goes on know with MajesticSEO and ahrefs, we had that, except instead we also wanted to feed that list to the search engines and cause those pages to be spidered so the search engines would discover those links, not just us. This seems to be a natural evolution for where Majestic and everyone else might go. So we published that thing and it was noindex, followed, so these pages were not in the index, but were finding all these links. But when we went to the link we were getting 404 errors. I dealt with Matt [Cutts] back then and it turned out that when they would index pages in the main index and they found the link, they put it in the link index — two different databases. When it went 404 in the main index they didn’t purge it from the link index. So the link index seemed to have 30, maybe 40 percent of the links actually passing PageRank no longer existed. And [Google] didn’t know it, because they didn’t purge anything from there. This was about 9 months, maybe 11 months before they were due to go public. This is my personal opinion: they couldn’t really go public and reveal to the world, because they’d have to, that they knew there was a bug in the PageRank database that was nearly 40 percent corrupted. What they did is very quick like a bunny went in and started rebuilding the link database. It appears as if what they did is they took 20 percent of the site — because they couldn’t do it to everybody all at once, they assumed a lot of it was still right — they purged all the inbound links to those sites and rebuilt them. Then the next 20 percent. Then the next 20 percent. And they walked through their whole database and it took them six to eight weeks. At least that’s how it appeared to us, and we were watching it. The big complaint was all the top ranked sites vanished — and this was right up until perhaps October — they vanished. All their ranking went away because all their PageRank went away and it took like 10 days and then their rankings came back. The next round, the next layer went away and then their rankings came back. Then the next layer went away and their rankings came back. And what Google in my opinion was doing was purging and recalibrating the link database. Logical thing to do. They finished it more than six months before their IPO. Nobody ever said it did exist or didn’t exist or what they were doing. Nobody explained any of it. But there was a massive amount of chaos around that Chicago update. Now what are we finding? Rob: Same M.O., it seems anyway, as Google continually goes out and recrawls all of the links that have been disavowed, that are going into factoring PageRank, if we can still use that term. Seemingly the timeframe would fall in line with 90 days, which is what Google has always said, that’s how long it takes for the worst of links, the sites they neglect the most, that’s how little they will go back and visit. But every 90 days or so they’ll go back and make sure it’s still there, and in this case, probably discount the links and the value of the sites that are associated with it. It’s interesting to see so much of what’s happening with Penguin 3.0 and now 3.1 if we’re going to call it that happening in international space. It seems there’s a lot of attention going on to those sites, the link graph as it relates on a worldwide scale, which is kind of an interesting dynamic and something that would probably, in the U.S. anyways, isn’t something that we’ve paid attention to in the past but certainly we are now because those international sites seem to be the first to be affected by this stuff. We see a lot of announcements from Google about shutting down link networks and a lot of them being overseas, Poland and these types of places. They’re clearly spending a lot of time and energy in cleaning up these types of things abroad, which is where a lot of bad links are coming from, at least for our sites as we go through and clean them up we see a lot of foreign domains pointing to folks. Bruce: Google’s main focus over time has been by language in the English speaking areas, there wasn’t as aggressive as spam detection capability for spam detection in foreign languages. Therefore I think a lot of spammers found that they could go to a foreign language environment and generate link farms and link networks, flying under the radar. Now Google has totally adapted and those are no longer invisible. As they suddenly pop up, we’re finding that perhaps what Europe is seeing is 2.0 detection. Because this is the first time it’s so readily available, this might be the history of the last two years catching up in Europe. Rob: We haven’t seen the last of Penguin and these types of fluctuations. There was speculation that the holidays might be a period where there wouldn’t be any major shifts or shakeups but Google kind of discounted that. They did it on Thanksgiving weekend, right before Black Friday, which is an interesting kind of dynamic. Clearly to be continued. Bruce: If the change really detected spammers, there won’t be a lot of complaint, there’ll be a lot of buzz. If it detected innocents, collateral damage kind of thing, then doing this right before the holiday weekend would be pretty bad actually. Google, in the past, has taken beatings where people have said to them that Google made the change to force people to buy pay per click. I really don’t think Google wants to be referred to as the Grinch. Ric Dragon is the CEO of DragonSearch Marketing, author of Social Marketology and contributor to Content Marketing Strategies for Professionals. Here’s a partial transcript. 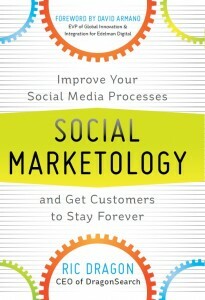 Virginia Nussey: In the social media section of the book Content Marketing Strategies for Professionals, which covers how social media uses content marketing, you laid out a case study of the Ford Motor Company and how they’re approaching social media with an always-on mentality. Social media is your passion in digital marketing. 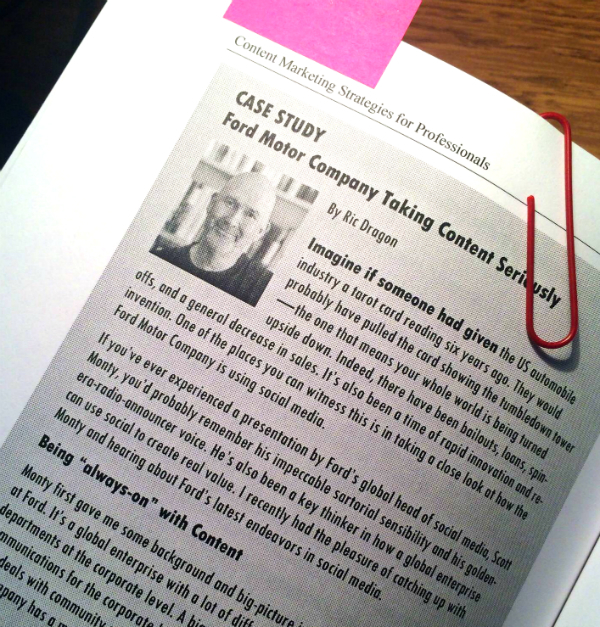 Why did the Ford case study stand out to you? Ric Dragon: The work that is happening at Ford has always been of interest. They’ve done some beautiful things. One of the things that has most excited me about their work is their development of a content portal. They’ve created their own home-grown portal where they can invite bloggers to come in and participate, and they can become, then, recipients of beautiful, quality content fresh off the press, so to speak. It’s like an old press room but it’s much more dynamic than that. It uses a bit of gamification. It uses a little bit of influencer marketing, if you will. It’s really incredibly clever and I like their whole mentality and their approach towards it, particularly when you compare it to the other large automobile manufacturers. Virginia: There’s a quote by Scott Monty who heads up their social there which was “having to educate ourselves on the difference between advertising and content.” And I guess that kind of speaks to that. Ric: Exactly. Now by the way, Scott has moved on in the past half year, he’s now over at Altimeter group, one of our most respected individuals in this industry, just a really smart guy, fabulous speaker. Just imagine you’re an automobile manufacturer and here you have your big huge marketing budget to make magic happen and the tradition is you go out there and you buy tons and tons of advertising. You’re basically trying to own that mindshare, that time-of-mind awareness that somebody thinks car they think your car. They think safe family car, they think your car. That’s sort of the game. Ford said we’re going to take it beyond advertising and embrace all this new media, user generated content, social media and some of the dynamic ways of using the platforms that are quite experimental on the forefront. Virginia: Case studies makes up a lot of your writing. You’re also a contributor at Marketing Land and Social Media Today. I noticed that case studies is a place where you find a lot of inspiration for sharing with people. Now one of the things I’ve noticed is that a lot of people think of social media as one big thing. Let’s go get our Facebook page. Let’s do a viral video. The most shallow approaches to the concepts of social media are what’s thought about there. What we’ve discovered in our research is that there’s actually five major approaches to social media. There’s that approach that happens in companies that really have a big customer facing relationship — airlines, banks, these types of entities — do very well with what we call brand maintenance. They do light content marketing and they’re interacting with customers. And then there’s community work which is where you’re placing yourself within a community, whether it’s an affinity community or a community of loyal advocates internally or externally. There’s the whole thought leadership which includes content marketing. There’s influencer marketing. And then the fifth is what we call the big splash, you’re big viral campaigns, the Old Spice guy, big campaigns that are designed to get a lot of attention but don’t necessarily build community or long-term relationships with influencers. So there’s these five major approaches and then there’s blends of these five, you can mix them up, whatever’s right for your company. Every single organization is different. The needs of every single organization are different. You can’t just cookie cutter and go “I’m going to do this.” You’re faced with the question of what should we do? What can we do? What are the possibilities? Thus I maintain that as a marketer, be an avid student of case studies because this is happening, the changes are happening so rapidly that you need to be out there looking at what is best of breed, what other people are doing and the successes they’re having or not. Virginia: Is that the kind of thing you lay out in Social Marketology, like how to come up with your own blend and a plan that works for you? Ric: Social Marketology is a framework and it’s more of what you might call a whole-system approach for developing strategy for an organization. There’s the internal, the external, all the aspects of the whole ecosystem that a brand exists in. We really believe in, for instance, doing what we call microsegmentation. Old school marketing always did segmentation but we take it to an extreme because in social media you’re not just talking about, for instance, people who are going to a particular school of music but people who are into world music and go zydeco dancing every Thursday night at that school of music. Much more particular. So we do that type of work. We’re a big believer in doing competitive analysis. We a lot of online research around communities and influencers. It’s really looking at the whole system and then looking at your big five approaches and developing that blend. Interestingly, the concept of doing that blend is touched on in the book but hadn’t been as fully fleshed out as it has been in the past couple years since the book came out. Virginia: Let’s talk about, then, developing your brand personality and voice, if we want to just dive into one particular issue that you cover in the book. Can you give us any tips or stories to illuminate that challenge? When you develop persona boards, you’re trying not to be generic. If somebody puts a stock photo up on a persona board you should give them a slap upside the head. It needs to be very specific, you need to think about real people. Now you can also turn the table and say let’s create a persona board for the brand. If the brand should wake up one morning, get out of bed, have a bowl of cereal, walk across town and knock on your door, who are you meeting? Are they nice? Are they grumpy? Is it a soccer mom? We actually did a replication of a study that came from the 1960s that if a certain brand woke up and knocked on your door, who would you meet? Interestingly the majority of people identified Starbucks as a soccer mom and Google as a hip, young Asian guy. They also identified British Petroleum as a grumpy middle-aged man. That was after British Petroleum spent over $550 million developing their new logo and painting it on the sides of all their trucks, signs and ships. Imagine spending $550 million and still being seen as a grumpy middle-aged man. If everybody working on social media for a particular brand is more cognizant of the brand persona, and you may decide overtime to refine it, from being this to a little more this. Develop that persona and then make sure it’s communicated to everyone on the team so that there’s more consistency.